John Battelle, a serial media entrepreneur and conference veteran who helped launch WIRED, The Industry Standard, Federated Media, and the Web 2.0 Summit, is no stranger to tech conferences. 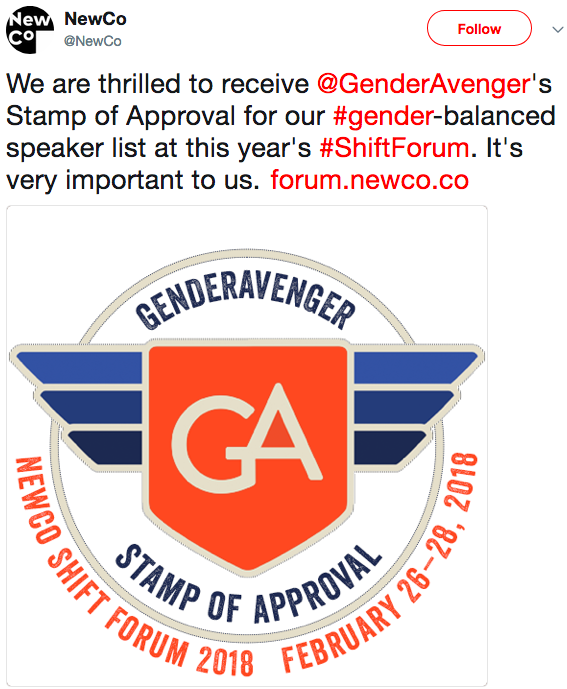 As the Editor in Chief and CEO of NewCo, he now produces the Shift Forum, a 2018 recipient of the GenderAvenger Stamp of Approval. As early as ten years ago, Battelle was ahead of the curve compared to most tech conference producers. One of his proudest moments was getting to over 35% women on stage at the Web 2.0 Summit, which was a big deal back then. He felt then, as he does now, that gender diversity was key to forcing a new kind of conversation on stage. You have to produce. I think deeply about how to get more people involved, what those people look like, where they come from, and what they have to say. I find that it is both exhausting and well worth doing. You’ve got to think deeply about why a human being is on stage in front of other human beings. You’ve got to help that person and you’ve got to help the audience. Your job is to make sure that person is successful. Battelle offers varied programming elements that help ensure success for a diverse group of speakers so that “people who are not traditional big business executives, thought leadership conference speakers, feel like they can get on stage and present what they want to present without having to hold a room for 20 minutes.” Offering shorter talks allows people who may not be headliners but have an extraordinary and relevant story to “bring a truth that blows people’s minds”. Curating with intention is not without challenges. 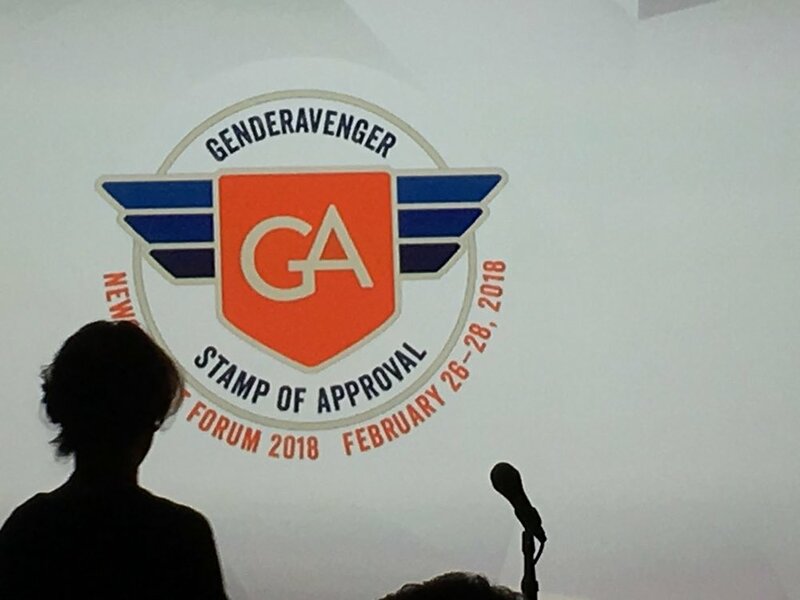 “Quite honestly, you’re going to get more no’s from women than you are from men, and you’re going to get a lot more yeses than no’s from men.” As a result, NewCo takes a proactive approach by ensuring that its pipeline of speakers always includes more women than men, and Battelle often asks his network for help. I’ve managed to create a relatively robust network of women who I’ve worked mercilessly. I’ve called women who I know and love and said ‘who are the women who blow your socks off?’ and demanded that they introduce me. That’s how I’ve found a lot of the people who ended up on stage. What I found was that the conversation on stage was so much better. So much better. In year one, one of the women I got connected to was Jennifer Aaker, a professor at Stanford Graduate School of Business, who just brought this insane kind of empathy and passion about why we work. I don’t know that I would have thought to put that on stage had I not been introduced to her by another woman. He mentions Susan Sobbott, until recently the most senior woman at American Express, who spoke at the Shift Forum about her decision to leave. Her willingness to be vulnerable — I don’t know how many men would say ‘I got passed over and it sucked and here’s how I’m dealing with it.’ You just get a different kind of conversation. It felt like a much more compelling, insight-laden, surprising, refreshing, cliché-free zone compared to a lot of events I’ve gone to where you have a lot of dudes speaking the same idiomatic language. Battelle’s commitment to diversity transcends the conference stage. 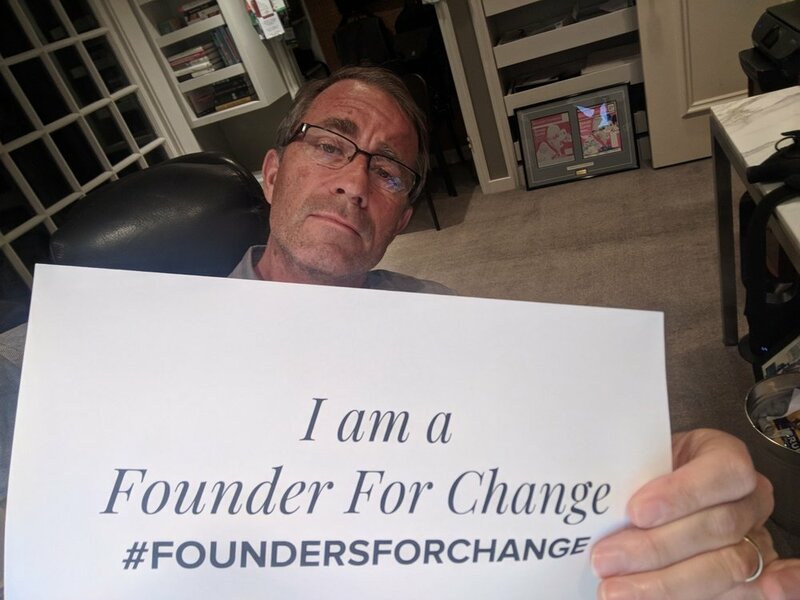 As a signatory to Founders for Change, which he says was a no-brainer, he joins 700+ CEOs and founders in taking a public pledge to have a diverse team and board and to look at the diversity of potential investment partners. It was a journey for me from not thinking about it when we started WIRED — we were not thinking about diversity or where we got our money, we were just happy to get some — through to Federated where many of my direct reports were women to NewCo, where at one point, all of my direct reports were women. And my co-founder is a woman. Event organizers and entrepreneurs with the foresight to look for a broader understanding of tech and its impact across society will do well to learn from Battelle’s leadership on inclusion. As he notes, curating with intention isn’t always easy, but the outcome is worth every minute.